All grown from disease free tissue cultures to guarantee healthy banana plants and fruit plants that will survive to produce lots of fruit. We Guarantee all Banana plants and Fruit plants 100% to arrive beautiful and not disappoint in any way. 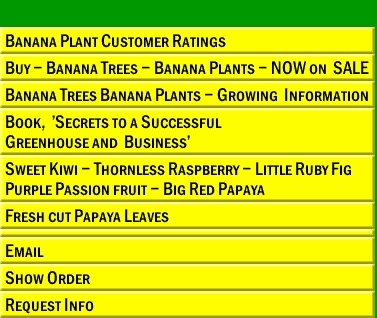 Available all Flavors of Banana Plants. All plants grown with organic principals. We are a Secure Yahoo Store. Our Return policy is Your choice of a replacement or full refund for a shipping damaged plant or any disappointment." We are a registered mail order Plant Nursery in Melbourne, FL. and try to give 100% Top Quality service. I guarantee you will be happy with our plants. All Plants ship together. We take all credit and debit cards, checks and Postal money orders. Our checkout is a Secure Yahoo Store. Great, so now you know what to do once you have bananas growing in your garden, but how do you start? Planting bananas You can not grow edible bananas from seeds. 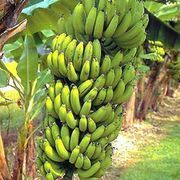 Edible Banana plants don't produce seeds. You just need to sprinkle on some fertilizer every now and then, to replace what you took out of the system when you took the bananas. Keep the fertilizer close to the trunk as bananas don't have a big root system. Growing banana fruit You may see your first flower emerge after about six months, depending on the weather. Leave the leaves around it, especially the one protecting the top bend of the stalk from sunburn! As the purple flower petals curl back and drop off they reveal a "hand" of bananas under each. Each banana is a "finger"
You can preserve bananas for use in cooking and baking by peeling and freezing them. Or, to preserve them for eating, peel, split in half lengthwise and dry them.